France and Germany are to sign a new treaty on Tuesday aimed at breathing new life into their place at the centre of the European Union. As the UK moves to leave the EU and a rising tide of populism challenges the core liberal values of the bloc, the new treaty commits wholeheartedly to defending it. There is rich symbolism in the signing in the German city of Aachen, which has changed hands over the centuries and is known in French as Aix-la-Chapelle. But will it ultimately change anything? In the draft, France and Germany agree to establish common positions and issue joint statements on major EU issues – formalising their existing co-operation. 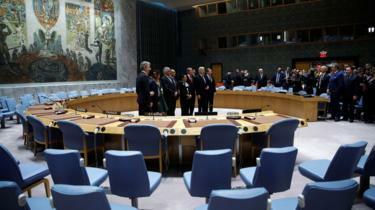 They also plan to act as a joint force at the United Nations. From foreign policy to internal and external security, the two nations commit to coming up with common positions while seeking to bolster “Europe’s capacity to act autonomously”. For young people, there is agreement to focus on cultural exchanges and increase learning of each other’s languages, with the aim of a Franco-German university. There are also plans for closer cross-border links and greater “bilingualism” on both sides of the borders. Many of these aspirations have been heard before. 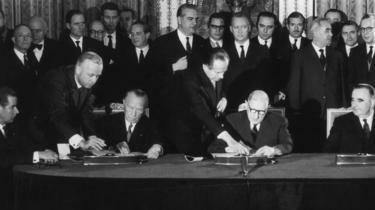 Exactly 56 years ago, the first Joint Declaration of Franco-German friendship was signed in Paris. “Since then, the spirit of the 1963 treaty has been evoked time and again by different French and German governments,” says Dirk Leuffen, chair of Political Science and International Relations at the University of Konstanz. Prof Leuffen believes there is no dramatic shift but instead “it continues or translates the old goals into today’s challenges”. He singles out the economic plans as potentially signalling a next step of aligning the two countries more closely. For Alistair Cole of Cardiff University, the importance of the treaty lies in its symbolism. In the context of a post-Brexit Europe he believes it is intended to “declare the centrality of France and Germany, though in practice the two countries often do not see eye to eye”. German Chancellor Angela Merkel said she would sign the treaty “because we believe that the world has changed dramatically” since 1963, and things such as European integration were “not yet worked out” 56 years ago. Is there much opposition to the pact? Some EU member states feel the two countries already have too much power. Central and Eastern European states have refused to accept German and French leadership on migration. 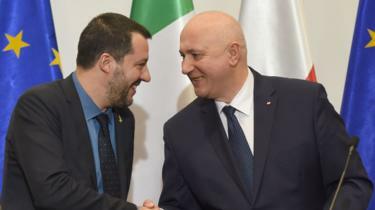 “It is time to oppose the Franco-German axis with an Italian-Polish axis,” said Italy’s right-wing Interior Minister Matteo Salvini on the day the final treaty draft was announced. He was speaking on a visit to Poland, aiming to challenge France and Germany’s dominance in the EU with a Eurosceptic alliance ahead of May elections to the European Parliament. The treaty itself has been the subject of considerable fake news in France, with conspiracy theories about Mr Macron going to “sign over” territory as part of the deal. One French MEP, former National Front member Bernard Monot, claimed in a video that the treaty would effectively cede the Alsace and Lorraine border regions to Germany. The allegation spread quickly on social media, despite several debunking pieces in the mainstream news media – and the fact that Mr Monot deleted his video. He also claimed that the language of the two regions would be switched to German. Far-right leader Marine Le Pen went as far as to accuse President Macron of going to Aachen on Tuesday to “essentially destroy what General de Gaulle had done, that is to say, lead France into the first league [of great nations]”. For Angela Merkel, history matters – her politics influenced by the legacy of Europe’s blood-stained 20th Century. In Emmanuel Macron she has found a partner who shares an appreciation at least for the symbolic weight of the past. Think of the powerful moment as the two leaders embraced as they commemorated the dead of World War One. No wonder they have chosen such a significant anniversary to launch, in effect, their plan to insulate Europe from its current period of instability. Critics in Berlin say the treaty is short on substance and that, symbolic or not, the resurgence of a dominant Franco-German partnership risks spooking eastern EU states. She will sign the treaty with one eye on how she’ll go down in the history books. The woman widely viewed as Europe’s de facto leader has after all presided over a series of damaging crises. Sceptics point out she is unlikely to remain in post long enough to see all of the treaty’s pledges honoured. Will the treaty change anything? President Macron’s power has waned since he was elected in 2017 with a commitment to a series of pro-European measures, including a common budget for the eurozone. Prof Cole believes the main issue is not the treaty but the “very uncertain future of Macron’s European reform programme”. However, he believes there may be some movement towards a more integrated security and defence strategy and, more controversially, towards debt-sharing in the eurozone. In the words of German Foreign Minister Heiko Maas, the two countries “are joining forces to fight for a strong Europe that is capable of taking action, a peaceful world and a rules-based international order”.